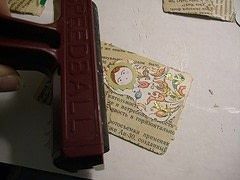 Playing Card s Glue Stick Mod Podge Paper Brown Ink Pad Marker Pen(s) , Crayons, Pens, Etc. Ephemera , Brads, Stickers, Etc. Gather your supplies. Depending on what kind of card you are making, you'll need all kinds of bits and bobs: ephemera, old postage stamps, beads, tags, glitter, brads, magazine cutouts, paints, stamps, etc. 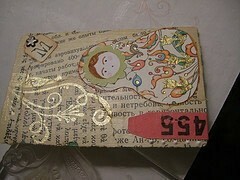 The possibilities with ATCs are endless! Begin with your base, I like standard playing cards because they are the perfect size and they are sturdy enough to hold up to layering and adding heavier bits. 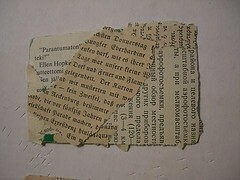 Spread a layer of glue over the entire base and begin tearing pieces of your old text. 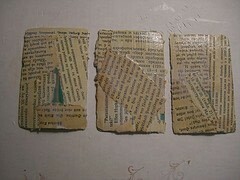 Apply them to the glue in overlapping pieces. It's ok if bits of the background show, since we'll be adding on top of this. Using a brown ink pad, rub gently across the surface of the paper. This will darken up the edges and add color to create an aged look. 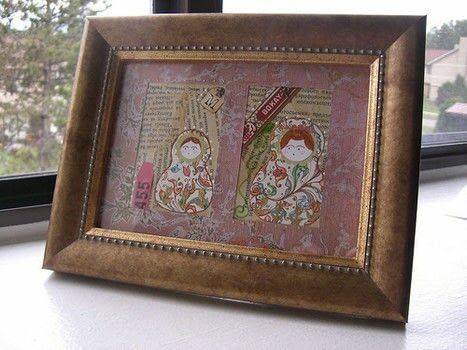 Seal your background by brushing on a thin layer of ModPodge. There all different kinds (glossy, matte, glitter) that will give different effects, so you can play around to achieve what you want. I used matte here. p.s. as you can see, I tend to work in batches so that I can create sets of cards with similar themes. While your base dries, begin cutting collage pieces for your next layer. 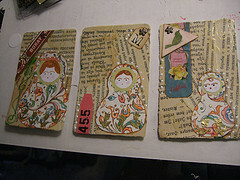 Since I am making a Matryoshka doll, I cut a body, bonnet, and face. I then drew the face with fine point markers. Play around with placement before using any glue. Once you have settled on a good placement, glue all pieces in place with a glue stick. Using a brayer, roll over the entire card with a bit of pressure. This will prevent any edges from pulling up later. Embellish like mad! Here you can see that I added flourishes in gold with a rubber stamp, added a brad and sticker in the corner, a tag from the dry-cleaning, and tiny gold tulip punches. 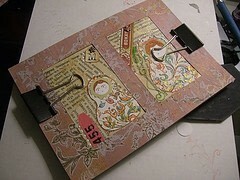 If you want to, you can seal the card again with ModPodge, but be sure to do this before adding any 3D pieces. I sealed it before I added the brad and tag. Then just sign the back with a title, your name, location, and email, and a date! If you would like to display your cards, there are tons of ways. 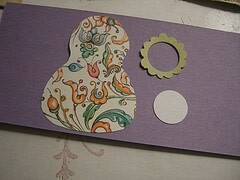 Here I used heavy piece of decorative cardstock. I measured and cut it to the size of a picture frame, then cut two rectangles for the cards to peek through. I added a bit of glitz to the cardstock and it was ready for framing. Those look great, thanks for explaining!